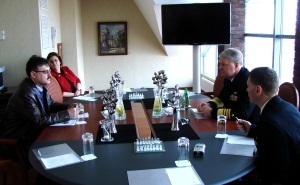 US Chief of Naval Operations (CNO) paid an official visit to Russia in April 14-18, 2011. 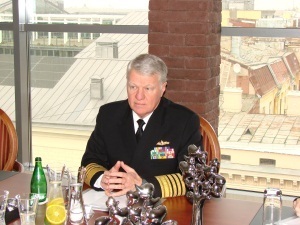 Since 2007 this post has been occupied by Admiral Gary Roughead. Despite the pretty tight schedule, Admiral Roughead agreed to contribute time to Central Navy Portal and answer the chief editor's questions. - Sir, could you tell about your visit to Russia? - Basically, our visit to Russia is going on very fruitfully. This is the first official visit of US Chief of Naval Operations to your country after a long break since 1996. And it is held thanks to an invitation made by Admiral Vladimir Vysotsky. This is a result of good working relations which were formed between us at an international naval conference about two years ago. I must say we have achieved such high results in cooperation due to a great mutual respect. We have met face to face many times both here in Moscow and in Washington, so my current visit to Russia and, above all, a chance to go aboard Russian warships have happened by virtue of our warm relationship. And I'm very glad things are going in this way. You must be aware that my visit started with arrival in Moscow and a meeting with Admiral Vysotsky. I have also met with General of the Army Makarov. Being a seaman, I was much pleased to visit Northern Fleet. I had spent plenty of time there with Admiral Volozhinsky and had an opportunity to go aboard a cruiser and a nuclear submarine. Russian ships made an indelible impression on me [the admiral visited nuclear-powered missile cruiser Petr Veliky and nuclear submarine Nizhniy Novgorod]. But officers and enlisted personnel I managed to meet impressed me much. Although we arrived in St. Petersburg yesterday and I has spent only one day here, magnificence of the city exceeded all expectations. I was fascinated with Peterburg's beauty so much that it was hard to breathe. Yesterday I had an opportunity to meet with officers of the naval academy. I could share my thoughts about prospects for our navies. To my belief, those capabilities we currently have in hand are wide enough for our future joint work. During my stay in Russia, I was struck favorably with Russian naval command, officers, and sailors I managed to meet with. Their openness and concurrence in opinions made me feel glad. - As for the US Administration, the Navy plays a great role in shaping of foreign policy. How do you think our navies could affect development of international relations? - I think, our countries do comprehend a singular importance of the ocean and maritime commerce. One should not forget about underwater natural resources either. We believe that general interest to the ocean would unceasingly grow in future. Ocean affects not only security of our countries but their future wealth and prosperity as well. Our nations understand this and have many common views on development of sea lanes. I'm very glad that we have achieved mutual understanding in many things. To me, now it is possible to determine a plenty of areas we could cooperate in. For instance, anti-piracy. As you know, there have been many changes in the Arctic too. This is another point to be mentioned, since it can also have a positive impact on our further cooperation. - Talking of the Arctic, by the way, Russia has very long Arctic frontier, Northern Sea Route also goes along our coast. What interests does the US have there? - We are also an Arctic country because of our state Alaska. In my view, current developments in the Arctic will be especially noticeable within the next 25 years. At first, we suppose fish migration routes would shift northward, so fishing fleets would change their activity zones too. I think agreements regulating potential activities in the Arctic of all interested parties should be developed today. They are vital because rescue missions are important objective assigned to our navies in increasing frequency. Besides, fisheries and extraction of benthal resources can lead to serious ecological changes and worsen international relations. After 20 years Arctic shipping will become much more profitable then now. To avoid possible problems in future, we should start working jointly now. Once we manage to elaborate basic principles on Arctic today, we would be ready for any difficulties tomorrow. - The world rapidly changes making navies change as well. As is known, sir, you actively stand for fastest introduction and commissioning of unmanned weapons into the US Navy. So you think human no longer can do his job? - No, actually, I think people can do much more things than unmanned vehicles. However, pilotless systems execute one task far better – they can be on mission longer than men. Besides, unmanned vehicles can be used in areas where people are unwanted. I mean, such systems perfectly do boring and dangerous things. Apart from unmanned aerial vehicles, I give much attention to crewless submarines, since deep-water operations are always life-hazardous. I see my mission in creation of unmanned systems which could complement man-controlled vehicles. I found at least two problems in implementation of crewless assets. Of course, the first one is all about technical issues, but the second one is the need to converse habitual stereotypes. Often I notice it is easier to overcome technical difficulties than change people's culture and habits. I satisfied with definite results we have achieved in creation of unmanned systems for the Navy. Now we have in hand a UAV capable to take off from small- and middle-size ships. And we're working on larger pilotless aircraft to be based on aircraft carriers. By the way, recently we held successful test of that vehicle. - Last question, sir. You have a personal page in Facebook. How often do you visit it to post comments personally? - All comments you can find on my page in Facebook were posted by myself. I know that not all officers do that, but any of my staff members may confirm everything I post is my personal thinking. Besides, I have a great photographer; she makes wonderful pictures and sometimes posts them on my page. I think this is very important. Frankly, I have assured myself that such new media sources as social nets like VKontakte and Facebook can bring information to a great number of visitors in the simplest and the most effective way. And I can't withstand mentioning their singular importance and advantages. I use such resources in my daily work, and they are of great help. In other words, it helps to be in the know. For one, the tragedy happened to Japan. You must know we have plenty of servicemen over there. My subordinates sent me good reports, and I could track all developments. However, sitting at my computer I checked webpages of various naval bases and their commanders, so I could understand what really feel people who serve there. I noticed their fears and disappointments. After all, that helped me to choose right vectors in the work and to determine areas needed special attention. In my view, we have just begun to perceive advantages of these new communicative means. One of the questions I was asked visiting Russian naval academy was about what are the most important subjects for naval officers to be studied and researched. I said one should know more about information technologies and their capabilities in on-the-fly data exchange among huge number of people. These new technologies will actively develop in the nearest future. I would love to stay here and continue our conversation until the day is over, but today I was done a great compliment – I must leave for the Peter and Paul's Fortress to make a traditional noon gunshot.